Day of the Proclamation, the activities in the Kota Tua, Jakarta are pile. This just reminds people that this thirst for activity in the area of historical Jakarta. Activities from 13 August will continue to progress towards the inclusion of fasting period. Activities take place not only in the morning or afternoon, but also to the early days. Wayang weekend, People's Party, and The Kota Tua Festival will warm atmosphere in Kota Tua, especially Fatahillah Park, next weekend. Wayang weekend which will be opened on August 13 nights will open with Drama Betawi with the act of taking Fatahillah. The next night, puppet show will be held until the early hours Sunday. 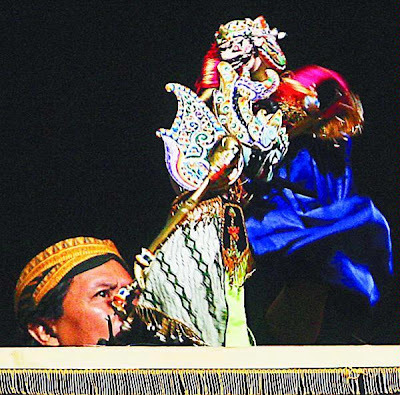 Wayang weekend will lasted until August 19 and in addition to puppet performance, a program that will include exhibitions, among other images, such as regular performance puppet shadow play purwa, and seminars on governance showroom Puppet Museum. Hajatan Wayang at Taman Fatahillah will resume in the Museum Wayang start date of August 16-19. Purwa Puppet most popular among the Java community than other types of puppets such as the Wayang Madya, Wayang Gedhog, Wayang Dupara, and Wayang Warta. The Wayang Purwa have more value in a flow and story script could accommodate a variety of actual problems that developed in the community, the number of more prominent, more diverse character, and the dramatic story used as a reference for another puppet show. Purwa Puppet Show is effective counseling as media, education, propaganda, and so forth. Even among the traditional Javanese, Purwa Puppet show skin work for the interests of private rituals (birth, circumcision, hajatan, mitoni (praying in seven months for those who are pregnant) and the media to deal with natural mites (Ruwatan sukerta, nyadran (the fasting), sedhekah bumi, suran (satu suro). The puppet show is made of carved wood and shaped in accordance with the story actor for example from the Mahabharata and Ramayana. Shapes similar dolls (doll in the Java language means that the dolls) that were given clothes / clothing, cloth, and a shawl. In performance can appear more alive with a three-dimensional form that can be driven from his head to the body so as to be unimpeded by hand manipulator. Since the Wayang Museum inaugurated, August 13, 1975, until 5400 there is now a collection of the archipelago and abroad. In the museum collection is full of all types of puppets, among others, such as Indonesia's Wayang Kulit, Wayang Golek, Patung Wayang, Wayang Topeng, Wayang Beber. In addition, the display dolls and puppets from other countries such as Thailand, China, France, England, Poland, and Vietnam. Back at the ceremony at Taman Fatahillah, beside Puppet weekend, at the same time also held Pesta Rakyat that will held at 13 and 14 August through to the annual event Jakarta Municipality Government, The Old Town Festival. Head of Technical Unit (UPT) Wayang Museum, Dachlan, said, opening the Pekan Wayang the United States Embassy symbolically will submit related assistance to the museum. "Help in the form of experts. We are requested perfection storage (collection of storage space), this is more useful than making vitrin (save the collection on display)," he said. Other assistance that is already is bound for the website, conservation puppet, puppet road show, and promotions. Making vitrin is not necessary because this museum has a vitrin. "I hope this kind of help we get will be from France.